First things first: What Is a Species? "To answer your question we first must ask, "What is a species?" The simple answer is "Two kinds of plants or animals that are different." But, of course, it really isn't as easy as that. You might ask, "What do you mean by different?" and that would be a good question. Usually it means that they look different. Eastern Bluebirds and American Robins look different, and they are different species. However, male and female Cardinals also look different, but they are not different species. They are simply different sexes of the same species. So there must be more to it than that. Biologists, therefore, often define a species as a group of individuals who cannot mate with individuals of another group (species) and produce healthy young that will be able to reproduce when they are adults. For example, the Hooded Merganser and Common Goldeneye (two kinds of ducks) sometimes hybridize, but the young that they produce almost certainly cannot breed and produce young. Also matings between these two ducks are very rare. Thus, they are not considered to be the same species." When John James Audubon painted these birds in 1836 and 1825, he considered them to be two different species. For about three decades starting in the late 1960s, many ornithologists thought they were the same species and "lumped them" into the Northern Oriole. Now they've "split" them back the way Audubon thought they were all along. Dr. Rising continues, "Why have scientists' ideas on whether orioles are one or two species changed over time? About 50 years ago people found that in the western prairies there was a zone where both Baltimore and Bullock's Orioles are found. Many individuals had one parent that was a Baltimore Oriole and one that was a Bullock's Oriole, that is to say, they were hybrids. These hybrids appeared to be perfectly healthy and they themselves mated with other orioles and produced healthy young. The scientists reasoned that because of this hybridization in time the two kinds of orioles would blend into one single kind of oriole. 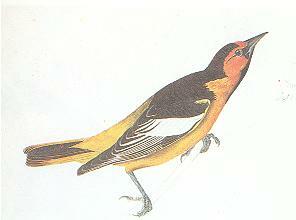 Therefore, they combined them into a single species, and named it the Northern Oriole. "However, other scientists revisited this "hybrid zone" in the prairies over a period of 30 years, and most recently in the 1990's. What they found was that yes, indeed, there are still hybrids there, but at all localities there were also individuals of the pure Baltimore and Bullock's Oriole types. In other words, there was a good reason to believe that hybrids existed only in a limited geographic area, and that the two kinds of orioles were not going to blend into a single type of oriole. Therefore, they decided to recognize both species once again." Dr. Rising's fascinating oriole research centered on the "zone of hybridization," and his work there formed much of the basis for the American Ornithologists' Union's new changes. Other ornithologists also studying orioles have contributed additional information supporting the AOU "split." DNA: Recent studies of mitochondrial DNA (the DNA in the mitochondria of cells, which many scientists use to show relationships among various animals) show the Baltimore and Bullock's Orioles are not even very closely related! The Baltimore Oriole shows more genetic similarities to the Altamira Oriole (which lives in Mexico, northern Central America, and a tiny part of Texas) and especially to the Black-backed Oriole (from Mexico). 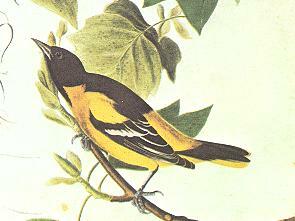 Bullock's Oriole is more closely related to the Streak-backed Oriole (from Central America, Mexico, and rarely southern Arizona and California).